Life has been unusually crazy. School is, in a word, overwhelming. Winter Storm Alfred put a wrench into the normal flow of life and we still haven't quite recovered from that. Chris is in Florida this week, invited to watch the launch of the Mars Rover and attend an educators' conference at NASA. My mother hosts Thanksgiving and I'm headed there Thursday afternoon. All of which means, I'm pretty much not cooking this year. Still, I wanted to write a post, so... 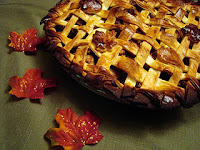 This post features some of my favorite fall recipes that I think would be fabulous for the Thanksgiving table. Happy Thanksgiving to one and all!!! I'm thankful for you, our readers! Although most people would expect me to say "Fried!!!" but I actually prefer the results of dry brining. 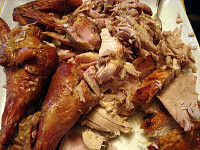 Moist and tender turkey with a wonderfully crispy skin, plus all the parts cook evenly. To me, that's turkey success! Next time we make this, we'll take a better picture, promise! 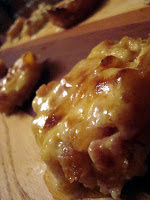 This year, Mom asked me to bring our award-winning (runners up in the 2010 Sweet Potato Bloggers Contest) individual Sweet Potato and Pancetta Gratins, which she has never tried. These are delicious, not only as a fall side dish but even for breakfast or brunch. Chris has been known to build an egg sandwich around them as well. 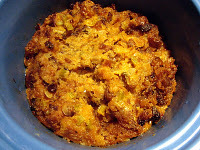 A definite favorite, and what says "Thanksgiving" better than the sweet potato? A modern twist on Grandma's classic bread stuffing, we love this stuffing we created with panettone. It has a great mix of sweet and savory flavors, and an added bonus is that it's made in the slow cooker so you have more room in your oven and on your stove-top for the rest of your dishes! Gravy, in some form, makes an appearance at everyone's Thanksgiving right? This gravy is easy and delicious, and goes really well with turkey. We were finalists in the 2010 Food 52 "Your Favorite Gravy" Contest with this one; they created it in their test kitchen and there is a great photo of it there). It's a winner in our book! 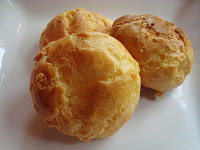 Why have a plain old dinner roll when you can have light, cheesy, airy gougeres? Picking a seasonal cheese like maple-smoked gouda takes them to a whole new level and adds a classic French touch to the meal. Personally, I'm an apple pie girl. And I use refrigerated crust. Baking disasters are my specialty, so on holidays and special occasions, I tend to focus on everything but the baking and ask other people to bring dessert. That said, I make one or two apple pies every fall, and this one is my usual go-to recipe. Do as I say and not as I do...use those crust protectors! Chris is a big fan of making our own stocks. Stocks vary widely in flavor because of the number of variables involved, but this one was one of our favorites, with its deep brown color and rich turkey taste. We used it as the basis for both pot pie and soup, and froze the rest. Don't throw that carcass away! Make stock! It's easy! The baked turkey casserole sounds great. 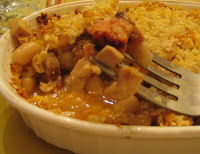 This could be the year we revamp one of our pot pies with turkey. Have a great Thanksgiving! Love this Best Of post. Nice selection of recipes.